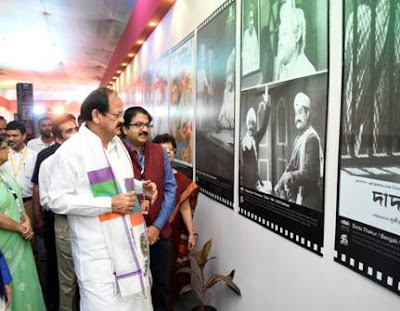 Panaji : The Minister for Information and Broadcasting, M Venkaiah Naidu, on Monday, inaugurated the multimedia exhibition centred on the theme of ‘Aazadi 70 Saal, Yaad Karo Kurbani’ to commemorate 70 years of India’s Independence and its depiction through films. The multimedia exhibition was setup by National Film Archives of India at the 47th International Film Festival of India, 2016, in Panjim, Goa. The minister said that India and its independence struggle had a great past which was showcased in its cinema. It was our responsibility to pass on the past to present and take it to the future. The exhibition thus, can be a centre of inspiration for the coming generation. Naidu said that unity in diversity is a special trait of our country and films have a big role in ensuring this. The Minister also inaugurated the revamped NFAI website, NFAI New Year calendar with a theme of Dance in Indian Cinema and Exhibition on Virtual Reality. It is one of its own kind technological innovation of VR wherein people can visit NFAI premises and the exhibition through a VR gear.